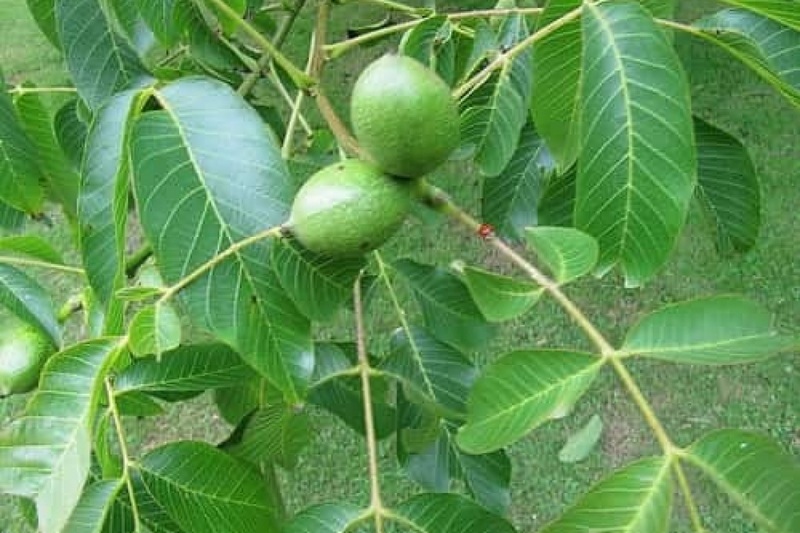 Walnut tree (Juglans): growing, planting, caring. Wallnuts are light-demanding, you’d be nuts not to plant one. Juglans is the type genus in the family Juglandaceae. Species are deciduous trees growing to 10–40 metres (33–131 ft) tall, with pinnate leaves, and flowers appearing in Spring. The walnut trees - Juglans - are tall, deciduous trees with very branched branches and a broad, bushy crown. The small, greenish flowers are unisexual. Male (staminate) flowers are grouped in ears or elongated kittens; the female flowers (pistillates) are grouped in groups of 2 to 4, they have a bilobed stigma. The fruits are usually drupes containing a single seed, with developed cotyledons, rich in fat: the fruit that grows on the tree is the walnut! Walnut requires a deep soil, rich, permeable and tolerates limestone quite well. Bewate, it grows to reach 20 meters high and 15 meters wide! Plan if possible to dig a few weeks beforhand a sufficiently large hole: 1 meter is good! In the sun, of course. Be careful, young shoots fear frost, which will not be the case of the acclimated adult plant. Planting bare rooted plant is done only in winter, while you can plant clumps and trees in container until spring. In bare root, shortening the roots and soak them in a mixture of earth and compost). Plant in a hole at least 20cm larger than the root ball, gradually put the crumbled soil back, tamping regularly around the roots. Water just after planting with at least 50 liters of water that you pour into a hollow formed around the trunk. A stake planted in the hole, inclined, facing the prevailing winds, will be useful, provided you use a suitable flexible attachment. Walnut does not like pruning! Use it only as a last resort. Turn your pruning shears so that the blade is on the side of the part to be kept. Oh yes, use a pruner very clean, even disinfected! Harvest from September to November, when the hull cracks slightly, or easier: when the fruits fall to the ground! Eat them quickly or dry them in the sun! Some compost and mulch made of wood placed at the base of your walnut in early winter, will be beneficial especially for young ones.